Our mission is to innovate smarter and more efficient products that offer new cleaning solutions for the pet industry. 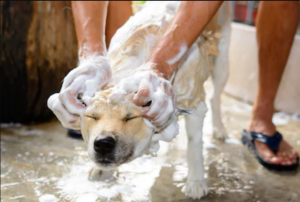 Our goal is to promote a better hygienic environment and to strengthen the bonding experience between owners and their pets by reinventing the way we clean our pets. 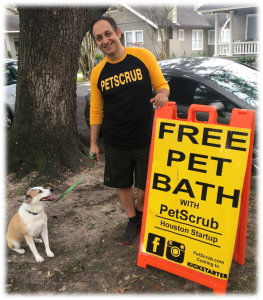 Like many other successful products’ stories, PetScrub was created out of a need for a better solution that would save time, money, and frustration. Our founder, (Kamel Takla), started PetScrub in his tiny outdoor patio. 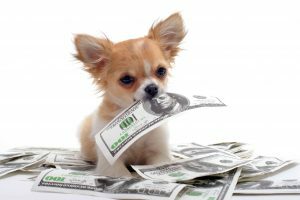 His frustration grew bigger every time he spent his monthly pet grooming budget, of $65, on his dog (Izzy), only to realize a week later that Izzy’s hair was covering his condo all over again, which indicated that she was ready for a second bath! As Izzy’s grooming service cost started to increase, Kamel decided to take over her cleaning chore. With his demanding work schedule and a baby on the way, Kamel couldn’t keep up with the weekly cleaning routine; that required him bathing Izzy, drying her and cleaning all the mess that came along with the bathing process, which ended up being a bigger chore on its own. So Kamel made a resolution to invent the machine that can clean Izzy in less than 10 minutes, use as little water as possible, de-sheds Izzy’s hair, can be used anywhere without creating a big mess, and most importantly Izzy would LOVE. So after a little over two years and so many modified prototypes made PetScrub was born.